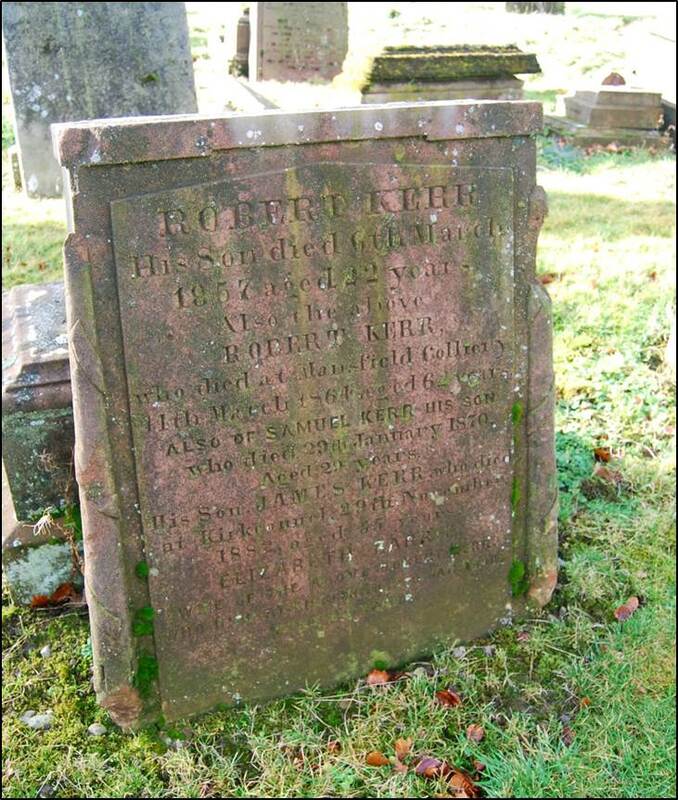 Robert Kerr was born in 1803 at Sanquhar the son of James Kerr (coal-agent) and Mary Milligan. He married Elizabeth Barrie and together they had four sons and two daughters, all born in Kirkconnel, where Robert worked as coal banker. By 1851, Robert is the manager at Mansfield coalworks in New Cumnock and the family living at Mansfield Cottage. Two of his sons also work at the colliery, John as a coal salesman and Robert as the engine-keeper. The colliery was on Grieve hill on Mansfield estate, owned at that time by Sir James Stuart-Menteth, Baronet of Closeburn and Mansfield. In 1858, Robert Kerr entered into a partnership with James Gray of the neighbouring Pathhead Colliery, to operate the collieries and limeworks operated by the Stuart-Menteth family. As the coal-master Robert, lived in the small miners’ row on Grieve hill adjacent to the colliery, along with his wife Elizabeth, son Samuel (engineer) and daughter Mary (house maid). Robert died here, in 1864, aged 62 years. He is buried in the Auld Kirkyard of New Cumnock alongside his wife Elizabeth and sons Robert, Samuel. Archibald Gray was born in Parkhead, Glasgow the son of a coal-miner and like his father he would later work in the mines. He married Jean Robertson and together they had a large family . At aged 50 years old he was working in the pits at Rutherglen and 10 years later in 1851, he had progressed to be the coal-master at Drakemire in Dalry, Ayrshire. Here he established Archibald Gray and Company to operate mines at Court Hill, Dalry and Pathhead, New Cumnock. 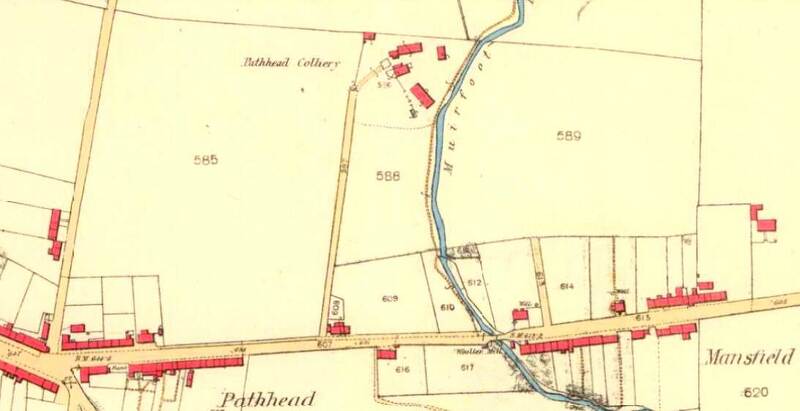 In 1856, Pathhead Colliery was valued at £260 and was the largest undertaking in the district . One of the pits was situatedon the banks of Muirfoot Burn which effectively marked the boundary between Pathhead to west and Mansfield village to the east. The following year Archibald Gray died at the family home in Dalry and he is buried at Tollcross cemetery, Glasgow. One of his sons, also Archibald, made his name as the manager at Glengarnock Iron Works, Kilbirnie. Archibald’s son James Gray moved from Dalry to manage the Pathhead Colliery. He and his wife set up home at Pathbrae leading down to the Mansfield Road where in 1855 the first of their New Cumnock born children arrived. James entered into partnership in 1858 with Robert Kerr (see above) to work the collieries and lime works of the Stuart-Menteth family, until the partnership dissolved following Kerr’s death six years later. 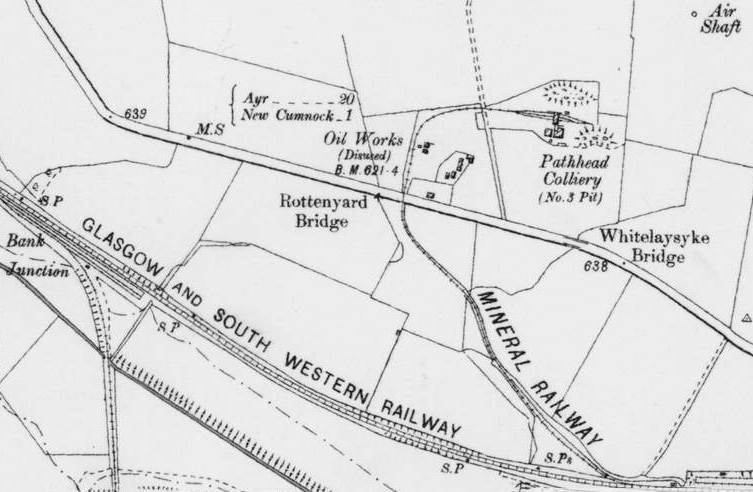 James Gray continued to develop the coal reserves on the Cumnock side of Pathhead, below Rottenyard farm and established a branch line to the main Glasgow and South Western Railway. 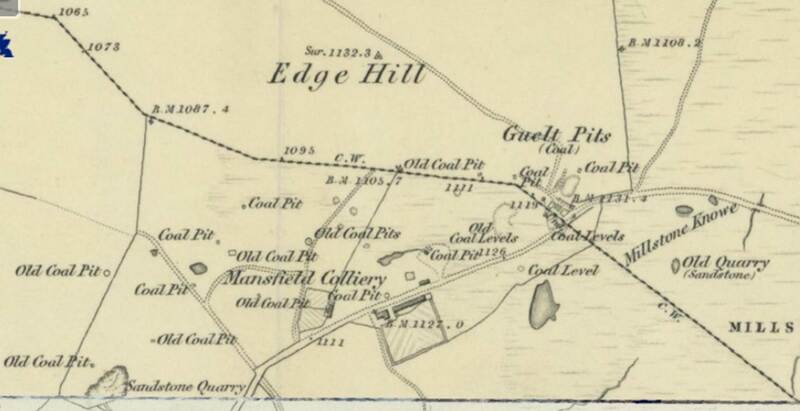 Around 1866 an Oil Works was established by Messrs Brown and Co adjacent to Patthead Colliery (http://www.scottishshale.co.uk/GazWorks/PathheadOilWorks.html) to extract shale oil from the rich seam of cannel coal at Pathhead. However this appears to have been a short-lived enterprise and the plant abandoned. 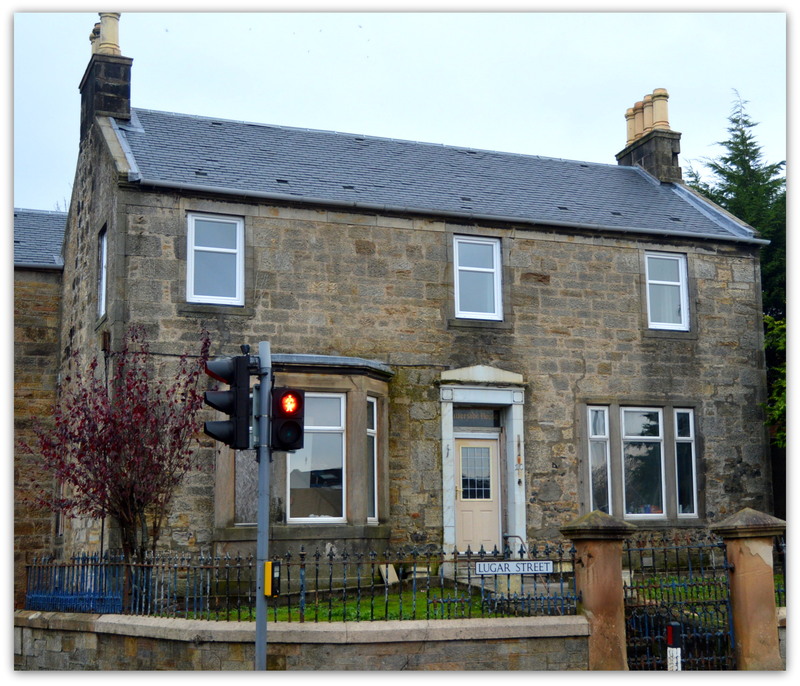 James established a new family home at Riverside House, on the banks of the Lugar Water, at 1 Lugar Street, Cumnock. The Gray family is found there in the Census Records from 1881 through to 1901; including son James (pit clerk) and Archibald (colliery manager). In his retirement James served on the School Board of New Cumnock and a Justice of the Peace in Cumnock. 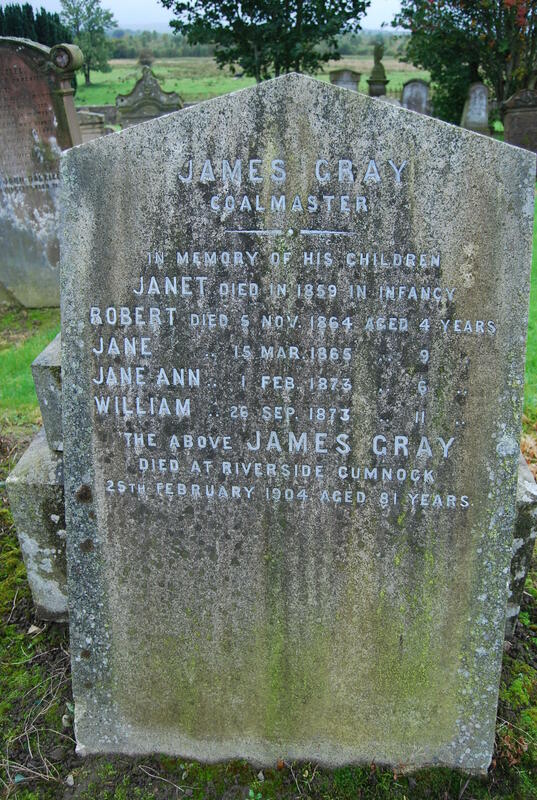 In 1904, James Gray passed away at his home in Cumnock, aged 81 years old. Five of his children had died in their early years and are buried in the Auld Kirkyard, New Cumnock, where there father rests too. 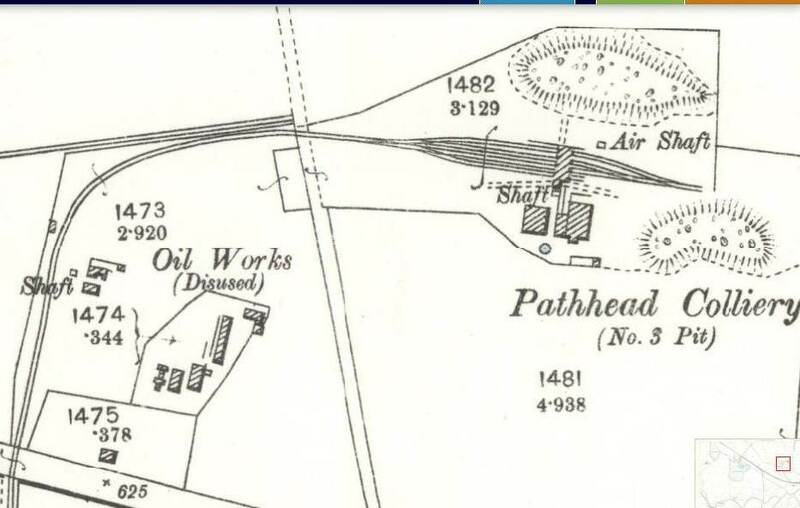 The Pathhead Colliery was acquired by the Polquhairn Coal Company (who also operated a colliery at Coylton) the following year was abandoned some 20 years later. This entry was posted in Auld Kirk, Headstones and tagged Archibald Gray, James Gray, Mansfield Colliery, Pathhead Colliery, Patthead Oil Works, Robert Kerr. Bookmark the permalink.